. b. Import Freight Forwarder (IFF) = ISSUER of Air way Bill / AWB (5-7 days BEFORE cargo is in US): OVERSEER of cargo to CFS warehouse//port. 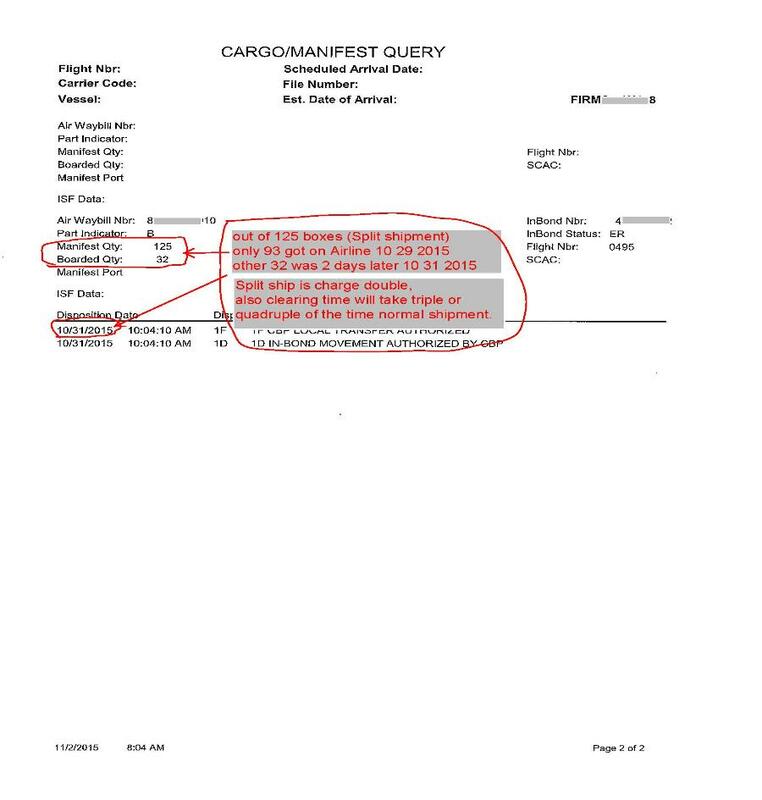 c. Two arrival notice: PRE Air way Bill / AWB, 7 days Before vessel is in US port & after/before vessel in US warehouse/port, Final Air way Bill / AWB.
. b. But, IF Export Freight Forwarder has issued Bill-of-Lading, your Import Freight Forwarder will be issuing Airline Air-Way-Bill / AWB & Arrival Notice.
. c. Split ship is charge double, also clearing time will take triple or quadruple of the time normal shipment. Do to Underinvoicing occurs with some of the importer & exporter, you need clarified that your shipment is Close-Out. 2. Importer need to provided how it was paid to supplier, if wired, please email copy. 3. Signed affidavit that you are not relate (No relationship) it to your supplier/factory. 4. Your supplier/factory need to stated why, when & how it became close-out with Signed Affidavit. 5. All info that may help us/US Customs to understand. Filing + other $20 for Customs Clearing Entry Filing. The Fees are add it to your Invoice. Customs Import Specialist (click here). Also, First 2 factories/suppliers invoice submission are free for Customs Clearing Entry filing, under same Bill-of-Lading(B/L). transport of cargo from airport to airport. By accepting a shipment an IATA cargo agent is acting on behalf of the carrier whose air waybill is issued. 1. The first three digits are the airline prefix. Each airline has been assigned a 3-digit number by IATA, so from the prefix we know which airline has issued the document. delivery*. The other copies are all white. receipt of the goods and letter in instructions from the shipper. responsibility for the goods. The validity of the air waybill and thus the contract of carriage expires upon delivery of the shipment to the consignee (or his authorised agent). to irregularity, incorrectness or incompleteness of insertions on the air waybill, even if the air waybill has been completed by an agent or the carrier on his behalf. goods to the consignee on receipt of a bank release order from the consignee's bankers. been received by the exporter or the buyer's integrity is unquestionable, consigning goods directly to the importer is risky. are released to the importer only after the importer makes the payment and complies with the instructions in the AWB. Instructions which authorizes the forwarding agent to sign certain documents (e.g. the AWB) on behalf of the consignor. on whose behalf the agent signs or authenticates must be indicated. turn issues their own house air waybill to the customer. 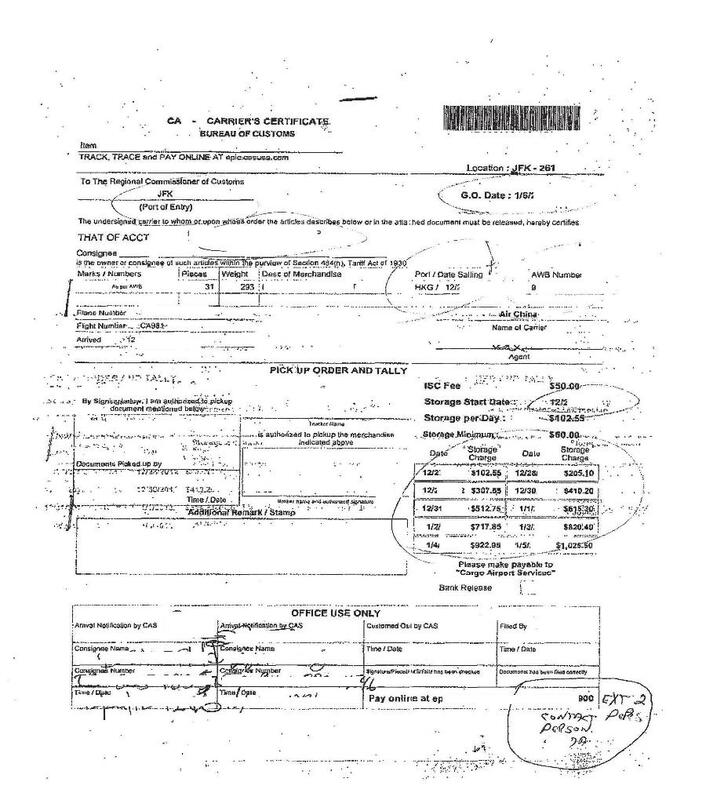 is called a Master Air Way Bill ( MAWB or MBL). 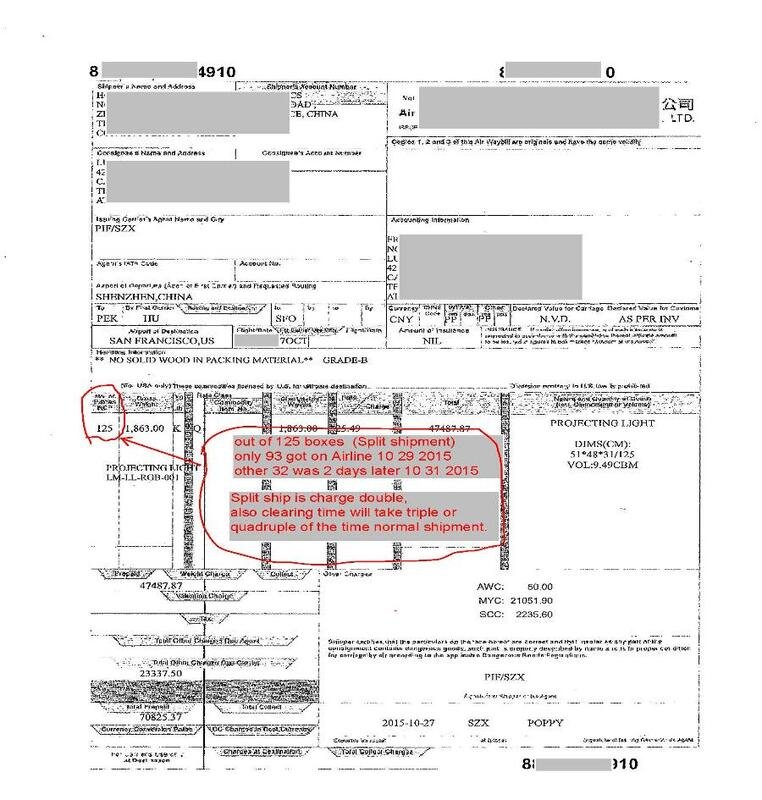 A House Air Waybill (HAWB) or Bill of Lading (HBL) could act as a multimodal transport document. The AWB number has 11 digits and 3 parts. Importers are responsible for all fees, US Laws & International Laws.